Airtel has finally launched its VoLTE services in most of the states, and if it’s still not LIVE in your state than don’t worry as it will go Live soon throughout the country. All latest smartphones comes with VoLTE feature enabled, but do you know that you could also use Airtel VoLTE feature in your current smartphone. Before that let’s find out more about what is Airtel VoLTE and what are the benefits of this new feature. VoLTE is a technology which is being used by Jio, so now Airtel is also on the track of Reliance Jio to provide its customers good quality services at affordable price. VoLTE denotes Voice over LTE is an advanced service through which customers can experience superior HD quality crystal clear voice with faster call setup time as compared to normal voice calls. While using VoLTE services, users can continue to have un-interrupted high-speed 4G internet experience. In VoLTE there would be no need to recharge your phone separately with voice and data plans, both voice and data plan would come into one pack. Which would cut down your monthly recharge cost. Now let’s start with the process on how to switch to Airtel VoLTE Feature on your Phone. Before proceeding further to switch to Airtel VoLTE you should make sure if your device is supporting Airtel VoLTE feature. You can find the compatible list of smartphone which supports Airtel VoLTE by clicking on below check compatibility button. So if your smartphone model is mentioned in page than yes you can proceed further to taste Airtel VoLTE on your smartphone. For Android Device: Settings > Settings > Mobile Network > Turn on VoLTE call. These settings may differ from one handset manufacturer to another. In case you need assistance, please call 121. If your smartphone is listed under compatible handsets and still you are not getting VoLTE option, than you should make sure if your smartphone device is running on latest software. Just open System Update and update your phone. 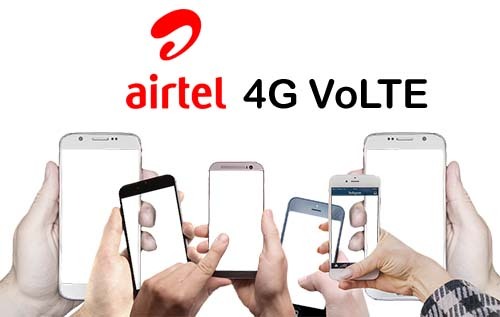 The next requirement to switch to Airtel 4G VoLTE is make sure you have 4G SIM, if you have old SIM inserted in your smartphone than you would not be able to switch to 4G Services. You can get 4G SIM free of cost online by clicking here or you can rush into Airtel Store. If you have passed on all above compatibility tests than here you go to enjoy VoLTE on your smartphone. Make sure Airtel 4G SIM is inserted into the device and verify that the VoLTE voice calling feature has been enabled on your smartphone. If you have Dual SIM than make sure the Airtel SIM is inserted in the SIM slot with 4G data capability. Than set network type to prefer LTE by going to Settings > SIM & Mobile Networks > Select the Airtel SIM > Preferred Network Type > Set it to Prefer LTE. That’s it your device will now show 4G with HD/VoLTE icon on top bar of the screen, indicating that your device is ready for VoLTE calls. 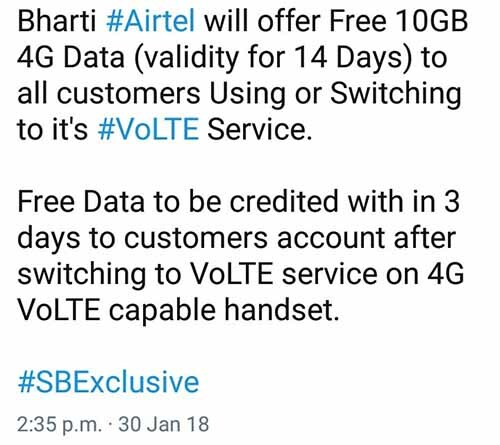 As of now Airtel is also running a promotional launch offer, where on using or switching to Airtel VoLTE Service you can get free 10GB 4G Data with validity of 14 Days. The Free data would be credited in 3 days to customers account after switching to VoLTE service on 4G VoLTE capable handset.